Especially for the Neue Nationalgalerie in Berlin, the Tyrolean-born artist Rudolf Stingel designed an installation which transforms the character of the iconic Mies van der Rohe building. Rudolf Stingel installed a giant carpet on the floor in the gallery’s large glass hall. The pattern of the carpet dates back to an original 19th century Indian Agra rug, and has been transposed into tones of black, white and gray. 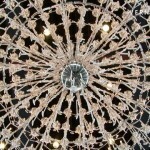 Over the carpet, a huge crystal chandelier hovers in the air. In addition to the installation, four new paintings are on view on the lower floor of the New National Gallery. Rudolf Stingel. LIVE is part of the Dornbracht Installation Projects series of events and an exhibition by the Nationalgalerie, Staatliche Museen zu Berlin (National Museums in Berlin), made possible by the Verein der Freunde der Nationalgalerie. Rudolf Stingel. LIVE / Neue Nationalgalerie Berlin, Press Preview and Opening, February 9, 2010.